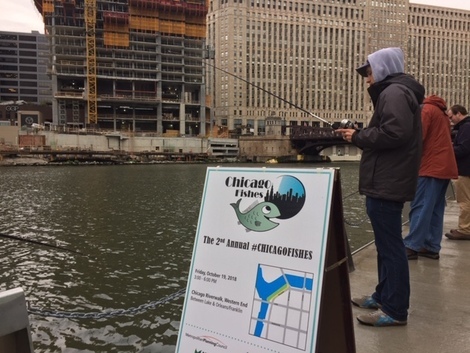 Despite occasional rain, cloudy skies and cool temperatures, the 2nd annual Chicago Fishes event attracted hundreds of people to the Chicago Riverwalk on Friday, October 19. 2018. With free poles free bait and free lessons, the event, uh, lured, kids and adults, first-timers and veteran anglers, tourists and locals. 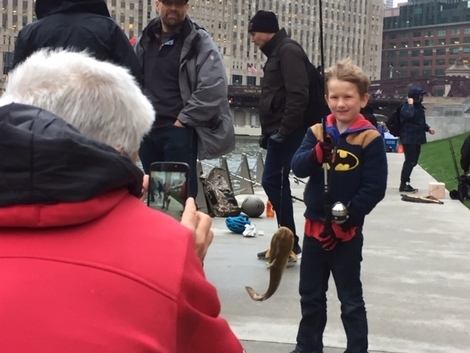 Sponsors included Friends of the Chicago River, the Chicago Park District, the Environmental Law & Policy Center, the Illinois Environmental Council, the Metropolitan Planning Council, the Shedd Aquarium and others. 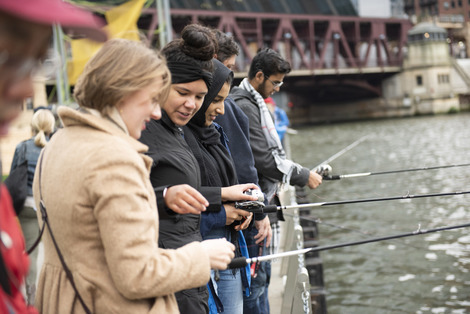 Fishing poles purchased for the event will be donated to support youth fishing programs in Chicago. 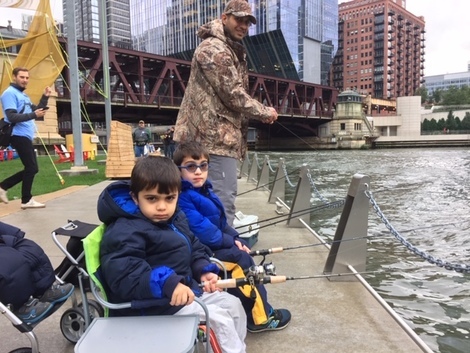 Last year's poles helped over 1,500 kids experience fishing in Chicago last year through various Chicago Park District programs. 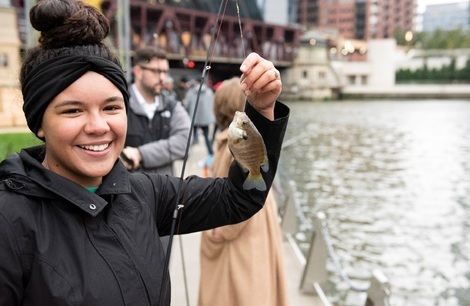 "Chicago Fishes is a terrific event that gets people right down to the water where they have a ball catching and releasing fish," said Margaret Frisbie, Friends' executive director. 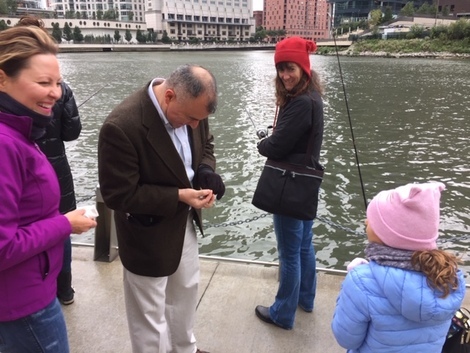 "And not only do the people fishing with us learn about the incredible diversity of fish that live in the river, hundreds of passersby do, too." Some 160 individual fish were caught over two hours – more than twice last year’s total. 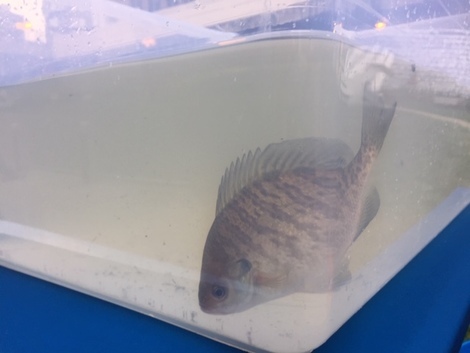 The most common catches included bluegill (Lepomis macrochirus) and green sunfish (Lepomis cyanellus). 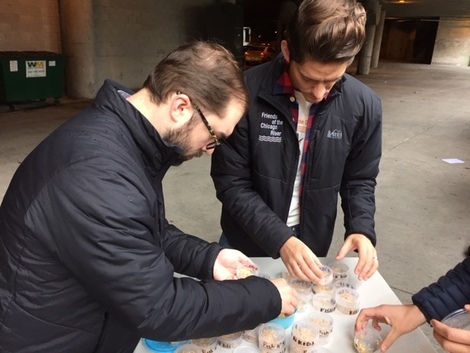 Participants used a range of bait, including bratwurst, pizza, French fries, maggots, and worms. “We’re at a tipping point – some people walking by thought it was the most natural thing in the world to have a group of people fishing, because it’s a river full of fish. Others were skeptical – ‘Cool, but are you catching anything?’ was the common refrain. To which we get to say, ‘You bet, bass catfish, blue gill… want to grab a pole?,’” said Josh Ellis, Vice President of the Metropolitan Planning Council. 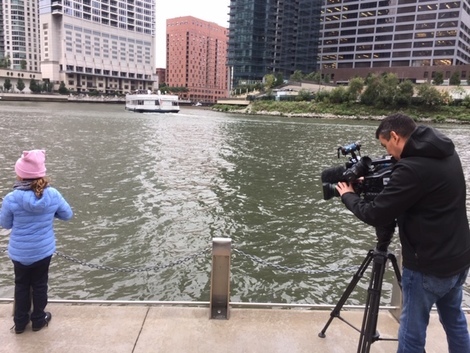 Some 70 species of fish live in the Chicago River. In the 1970s, there were fewer than 10 species. 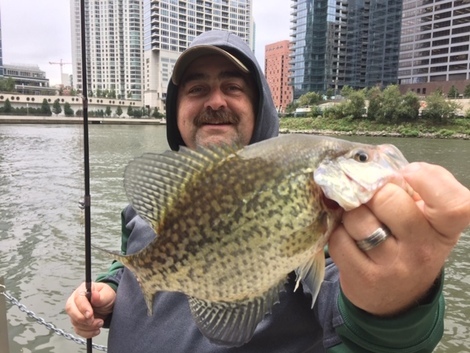 That's a pumpkinseed, one of the most common fish found in the Chicago River. Friends executive director Margaret Frisbie (center) waits for a nibble. Friends staffers Matt Sudman and Jeremiah Smith prepare the bait. Taking a break from the Chicago River before being released back. The signs point to a healthy river. 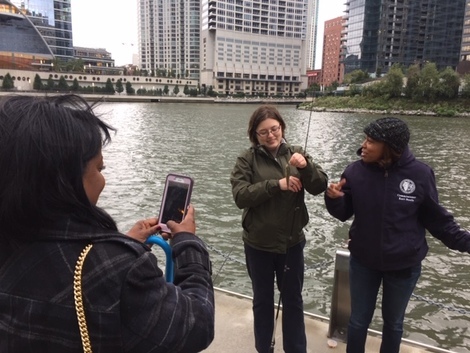 Metroplitan Water Reclamation District Commissioner Kari Steele reels one in. A little air time from ABC7. Great story from the Chicago Sun-Times Dale Bowman here.